Maybe for us, the tea water is definitely not useful, but from now on I suggest you do not throw away the tea water. In stale tea water is actually contained zinc compounds, vitamins, calcium, and various other minerals that are very good for normalizing hair pigmentation. The benefits of stale tea are not just to blacken the hair. The content of mineral essence present in tea water is also good to prevent the appearance of gray hair naturally. In order for maximum results, let stand stale tea water overnight. First, make a cup of unsweetened tea, then let stand for a night. In the morning, wash the stale tea throughout the hair. Massages briefly for 5 minutes to absorb, then let stand for 25 minutes. Finally rinse by using cold water until clean, or you can also shampoo. The benefits of avocado are immense. That said, the avocado is widely used by the royal queens to care for and maintain the health of their hair. After the investigation, the nutritional content in avocado is effective enough to make hair become healthier, moist, and black naturally. Prepare a fresh avocado, then scrape the fruit flesh by using a spoon or other means of scraping. Next mix the mushroom avocado with lemon juice. Stir well evenly to form cream/pasta. Rinse hair with cold water until clean, then apply avocado smoothing evenly throughout the hair. Cover using a shower cup or if there is no use of a wet towel for 30 minutes. Rinse with cold water until all the avocado is clean of hair. Maybe just see papaya seeds we already feel disgusted, especially if the seeds are used to the scalp area. But even so, papaya seeds are very effective for natural hair-blackening drugs. Even papaya seeds proved very good to moisturize hair and prevent gray hairs. First, prepare as much as 30 seeds of papaya fruit, then roasted without using oil to dry. Then mash the seeds until smooth. Then mix with coconut oil to form a shampoo-like dough. Apply papaya seeds smoothing evenly throughout the hair. Massage briefly for approximately 5 - 10 minutes, then let stand 30 minutes to perfect pervasive. To clean it, you can immediately shampoo. The green coconut contains enough fresh water in it. Usually the water is used to make ice that is very refreshing, especially if we consume when the weather is sweltering. But in addition to fresh, green coconut is also very useful for hair. Prepare a green coconut that is still quite fresh and salt enough kitchen. Scrape coconut without skin using tools, if not you can go to market. After that mix the coconut matte with salt until the kitchen evenly. Then squeeze to produce coconut juice (similar to coconut milk). Apply the juice to all parts of hair 20 minutes, then rinse with cold water until clean. For maximum results, do it for 7 days in a row. Hibiscus leaf is known to have a fairly complete natural mineral content. Starting from iron, calcium, potassium, and much more. These mineral contents are useful to restore the natural pigment of your hair. With regular use, guaranteed your hair will be more healthy and perfect beauty. First take as many as 15 fresh hibiscus leaves. Wash the hibiscus leaves while kneading to remove a kind of gel. Before using, clean the hair area by shampooing. After that, apply the leaf squeeze evenly throughout the hair. Let stand for 30 minutes, then rinse with cold water until clean perfectly. Coffee is a source of high enough caffeine that can prolong one's life. Usually, people are very fond of taking care of his face regularly with coffee masks. However, it turns out the content of caffeine and other compounds in coffee also proved efficacious enough to black hair. Brew the coffee as usual, then let it cool. Filter and separate the coffee from the pulp. Wash your hair by using the coffee for several times. Then rinse hair using a shampoo like shampooing usually. Tea is a lot of its kind. There are green tea, black tea, chocolate tea, and more. Europeans have proven a lot of great benefits from black tea, including one that is useful for making natural black hair. In addition, black tea can also be a solution for those of you who have hair loss problems and dandruff. Brewed black tea with hot water with no added sugar. Let the tea until cooled, then pour into the bowl. Rinse the steeping black tea evenly throughout the scalp. Let stand for 30 minutes, then rinse by using shampoo and conditioner until clean. Black walnuts have mineral compounds, vitamins, and other ingredients that are nutritious enough to blacken the hair naturally. Although rarely applied, but many people who claim to be satisfied after using this black walnut nuts. Interested? Prepare a handful of black walnut nuts, then geprek roughly. Boil the black walnut nuts by using enough water to boil. Let it cool down first. Strain water boiled black walnut nuts, then rinse throughout the scalp for 30 minutes. Finish by washing hair using shampoo until clean. Chocolate is quite synonymous as a symbol of love, especially when Valentine's Day arrives. Excessive consumption of chocolate is not good, because it can lead to obesity. But you can use chocolate to blacken the hair naturally from the outside. Mix chocolate powder with enough water to form a paste. Apply evenly throughout the hair part of the clean, let stand while covered with a warm wet towel. If it's 20 minutes, rinse the brown mask with cold water until it is perfectly clean. To be cleaner, you can use shampoo and conditioner. Note: add also a mixture of shampoo into a chocolate paste to maximize the results. Especially a special shampoo to black hair. Rosemary leaf has been proven for quite a long time as a natural hair-blackening remedy. The leaves of this type of plant contains a variety of nutrients ranging from minerals, vitamins, and much more. It is this content that proves very well to give the perfect black color to the hair naturally. Pick rosemary leaves just taste, then wash clean by using cold water. Knead the leaves until crushed and shaped small. then input into the cup to half the portion. Boil by using water as much as 1 cup to boiling. Allow the water to cool and then strain. Rinse water boiled rosemary leaves throughout the scalp area until evenly distributed. Massage for 5 minutes to make blood circulation smooth, then rinse with shampoo and conditioner. Rambutan leaves contain saponin, tannin, and polyphenol compounds that are proven effective enough to increase pigment production in the hair part. 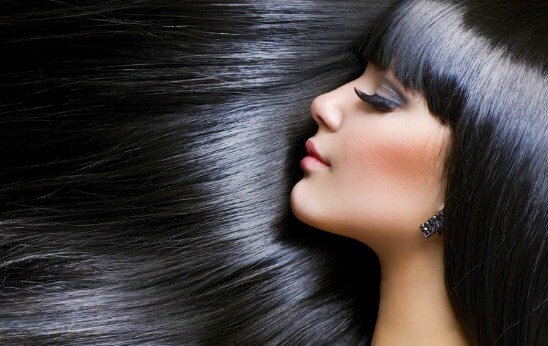 In addition useful to give black hair color, natural mineral content also proved very good to prevent hair loss. Rambutan leaf picks are still fresh enough. Crush the leaf by squeezing it until it breaks. Add a few spoons of water, then wring it out to remove the juice. Apply the juice evenly throughout the hair. After 30 minutes, rinse with shampoo and conditioner until clean. Prepare aloe vera to taste, try the newly picked. Break then take the gel in it. Apply gel evenly throughout the scalp. Let stand for 30 minutes, then rinse with cold water until clean. It is said that olive oil is often used by Queen Cleopatra, she is the most beautiful queens from Egypt. Finally the benefits of olive oil revealed by experts, including one nutritious to black hair naturally. First prepare olive oil or olive oil to taste. You can buy to supermarket or market if there is none. Make sure the hair is clean, then apply olive oil while massaged evenly. Cover with a warm towel for 30 minutes, then rinse with cold water until perfectly clean. It turned out that in addition to delicious consumed, raw mango fruit is very nutritious to black hair. But so that later the results are more leverage, make sure you also add fresh mango leaves. Prepare raw mangoes and leaves as needed. Puree both ingredients by mashing or using a blender until perfectly smooth. Add a little water to form a paste, then apply directly evenly throughout the hair. Cover a warm towel for 30 minutes, then rinse with cold water until clean. Here's the last one, yup you can use lemon and coconut oil. Both of these natural ingredients have proven to be very nutritious for treating hair health, including to improve the pigmentation that can blacken the hair naturally. Combine these two natural ingredients with a balanced and appropriate length of hair. Apply slowly throughout the hair, while applying a gentle massage for 5 minutes to sink. Next rinse with cold water until perfectly clean. Done. How, interested in trying it? How to blacken hair naturally above will be more leverage if you can apply regularly and consistently. My advice, do one of the above-above at least 3 days. Usually, within 3-4 months the hair will be black permanently. Hopefully useful and congratulations to prove. 0 Response to "How To Naturally Blacken The Hair Easily And Permanently"